Have you asked yourself "Why does climbing the leadership ladder feel like an uphill battle for women? Are the rules different for the boys?" Research has identified that there are different patterns in the ways genders behave in the workplace. In this 15 minute read, you'll be armed with 5 of the top proven tools that will help you focus your development effort right now, boosting your progress toward your leadership goals. Sally is a highly engaging and experienced facilitator who will quickly build strong rapport with your participants to create a very positive and interactive learning environment. This allows your participants to engage in a powerful learning process that generates profound insights and promotes a willingness to expand their leadership and personal effectiveness practices. Coaching is a powerful process that will maximise your leadership potential by giving you increased confidence, greater interpersonal effectiveness, enhanced decision-making skills and improved communication skills. 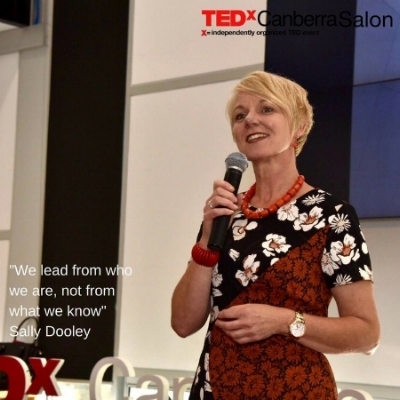 Sally is a highly skilled and effective leadership coach who combines best practice with a holistic and creative process to help you accelerate your effectiveness as a leader and across all facets of your life. Her experience working with leaders in a range of contexts combined with her academic and personal research uniquely positions her to help you achieve the outcomes you need. Sally’s unique gift as a speaker is to create an experiential moment that will inspire you to stretch to higher levels. Her presentation is highly engaging and her content is relevant and cutting edge. Regardless of her topic, Sally focuses on helping you to transform your thinking so you can behave your way to greater levels of success and contribution.